At a talk about technology and security on April 6, FBI Director James Comey shared that he puts a piece of tape over his webcam. “I saw something in the news, so I copied it. I put a piece of tape—I have obviously a laptop, personal laptop—I put a piece of tape over the camera. 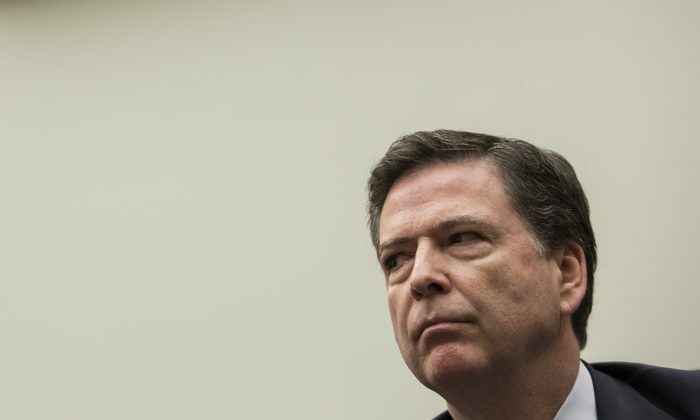 Because I saw somebody smarter than I am had a piece of tape over their camera,” Comey said. The remark was made during an event about privacy, security, and public safety at Kenyon College, Ohio. The FBI director has said he is “very concerned” about companies like Apple and Google creating privacy features that might allow people to evade law enforcement. The FBI took credit for hacking into the device of the San Bernardino shooter after Apple refused to comply—citing privacy violations. By warrant-proof, Comey means places where law enforcement can’t enter even if they have a warrant. For example, an un-hackable device would be considered “warrant proof,” or the new end-to-end encryption on messaging service, WhatsApp. Comey said the new security measures for WhatsApp means there are “a billion people now communicating in ways that can’t be intercepted even with a judge’s order. “We face devices that we can’t open, we face data that even if we’re able to collect it with a court order, we can’t read it,” said Comey. WhatsApp—which was bought by Facebook for $22 billion in 2014—made its service encrypted end-to-end as of April 5. “When end-to-end encrypted, your messages, photos, videos, voice messages, documents, and calls are secured from falling into the wrong hands,” a WhatsApp blog post states. In his talk, Comey stressed that the surveillance activities practiced by law enforcement agencies were by no means a blank check to intrude on personal privacy, but that the latter shouldn’t be absolutely privileged either. “There are vital constraints on law enforcement, and we must never, ever forget them. But the general principle is one we have always accepted in this country: There is no such thing as absolute privacy in America. There is no place outside the reach of judicial authority,” he said. Listen to Comey’s full remarks below. His comment about putting duct tape over his webcam comes in around 1:34:45. The event: “Expectations of Privacy: Balancing Liberty, Security, and Public Safety” by the Center for the Study of American Democracy Biennial Conference, at Kenyon College, Gambier, Ohio.